We must humble ourselves when seeking favors from the Lord. In His Holy Word, the Lord has promised us a lot and he will never fail us. But we need to do our part by becoming good children to him. He has promised in his Word that you shall be the head and not the tail. This promise will be fulfilled only as you act accordingly and obey him. As the promise is fulfilled, you will find yourself promoted at work as you prove your efficiency and dedication. You will rise to the top of the class. You will be noticed even when you think no one knows the effort you are putting out. Joseph was raised to the top by the Lord despite all the setbacks he had faced. He was made the head. Despite being a stammerer, it was Moses who lead God’s people. David was just a boy but he killed Goliath. You see, it might not be as fast or as easy as you would like. It may not be to your taste or style. But as long as you love the lord and trust in him, He will fulfill all His promises. Righteous and ever-living God, I come before you with absolute humility and a sober heart. I bless you for all your favors and blessings. Father, you are the master planner and everything you say and do is perfect. Lord, let your will be done in my life. Father, I ask that you take over my life and lift me up. 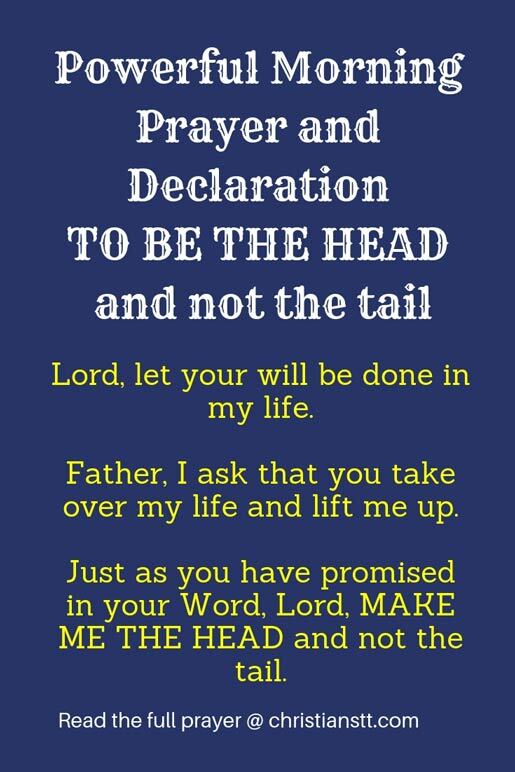 Just as you have promised in your Word, Lord, make me the head and not the tail. In my academics, place of work, social gatherings, fellowship, and where ever I find myself, fill me with your grace so I can illuminate your love and stand out and above. Father, I am not perfect that you would grant me all this. I am aware that I have wronged you a lot. Lord, help me to do better. I don’t want my sins to weigh me from getting to the place you have set for me. Fill me with your strength that I may resist the things that pull me down and takes me away from you. I ask this through your son Jesus Christ my Lord, Amen.